Eno Hlaalu is the Grandmaster of the Morag Tong. He is the only person who you can speak to if you wish to join the Assassin's Guild. He can be found underneath the Arena in Vivec. Like the lower Masters of the Guild, he will hand out Writs of Execution for you to undertake. In addition, he has some Special Duties for you which the Masters do not. Eno is getting old, and looking to retire from his position. When you reach a high enough rank, he will allow you to challenge him for his position as Grandmaster, or you may let him retire peacefully. If you let him retire, he will disappear once you leave the area, never to be seen again. He wears a common robe, common shoes and a unique pair of black gloves. Aside from his natural resistance to fire and the sanctuary provided by his ancestors, he knows no spells. When you kill him, he carries all of the Sanguine Items that you delivered to him yet (the first one he always has). It's recommended to kill him just after finishing the quest line Threads of the Webspinner to get the unique reward. "%PCName, you have found me. If you wish, you may request to join the Morag Tong." "Have you killed Feruren Oran? Are you ready to join the Morag Tong?" "First you must join the Morag Tong." 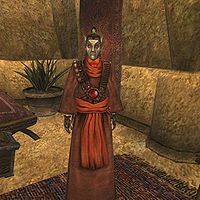 "He may be found at the Elven Nations Cornerclub in the Hlaalu Plaza here in Vivec. Slay him honorably and you may join the Morag Tong." [Oran is deceased.] "Are you here to report your success? If so, perhaps you can join the Morag Tong." "Yes, you have slain Feruren Oran. You belong to the Morag Tong." "The Morag Tong has been watching you, and we are pleased. One of your exceptional talent cannot go unmastered. Join us." Yes, I will join. : [Disposition +9; Honorable Writ of Execution has been added to your inventory.] "I will let you join as a probationer. To gain full membership, you must pass a test. Here is a writ for the honorable execution of Feruren Oran. You can find him in the Elven Nations Cornerclub, which is in the Hlaalu Plaza. Slay him honorably and report to me." "I have given you the authority to act in the name of the Morag Tong. You are charged with the honorable execution of Feruren Oran. Succeed and join us. Fail and die." "The Morag Tong executes writs and performs special duties as the ruling houses direct. Guild members never harm or steal from any brother or sister - regardless of rank. Never betray our secrets or our identities. If you break any of these rules, you must immediately speak with a Master to regain good standing or you may be targeted for execution. Do you feel you can succeed within these guidelines?" Yes. I wish to bring honor to the Guild. : [Disposition +9; Honorable Writ of Execution has been added to your inventory.] "I will let you join as a probationer. To gain full membership, you must pass a test. Here is a writ for the honorable execution of Feruren Oran. You can find him in the Elven Nations Cornerclub, which is in the Hlaalu Plaza. Slay him honorably and report to me." [Oran is deceased.] "Feruren Oran is dead? Then welcome %PCName, to the Morag Tong. Any Master of the Morag Tong can tell you what writs are available and weather [sic] you are a candidate for advancement. When you have proven yourself, I will have special duties for you." "You belong to us already, %PCRank %PCName." "The amulet of Sanguine Enterprise is one of the threads of the Webspinner. I already have this thread. Perhaps you will find other threads. When you do, bring them to me." "Come back when you have more experience." This page was last modified on 30 January 2018, at 01:21.